Johnnies running back Bryce Barasch scores a touchdown in the Pirates 32-14 loss Saturday night. Tanner Holden’s fourth quarter touchdown catch vs. Johnstown-Monroe Saturday night in Jackson. 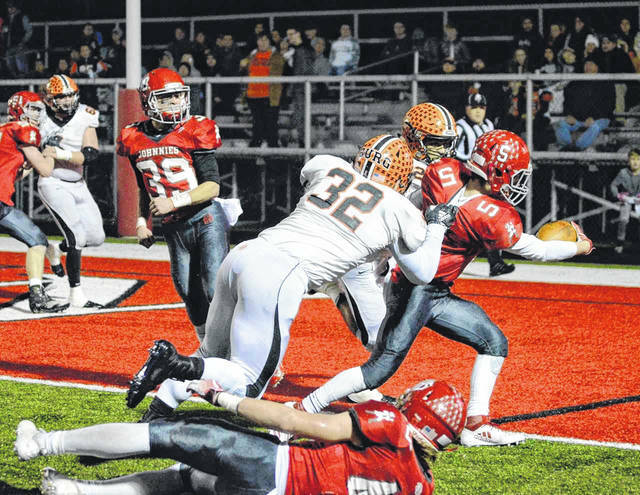 Wheelersburg junior Makya Matthews breaks a tackle vs. Johnstown Monroe Saturday night in Jackson. Wheelersburg senior quarterback Trent Salyers drops back for a pass in the Pirates 32-14 loss to Johnstown-Monroe. 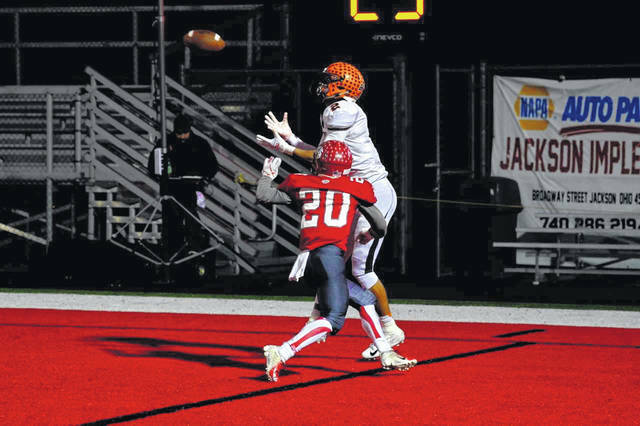 There will be a new Division V state champion in 2018 as the Wheelersburg Pirates fell to the Johnstown-Monroe Johnnies in the Division V state semifinals 32-14 at Jackson High School’s Alumni Stadium Saturday night. The Pirates chances looked incredibly promising to start the game. 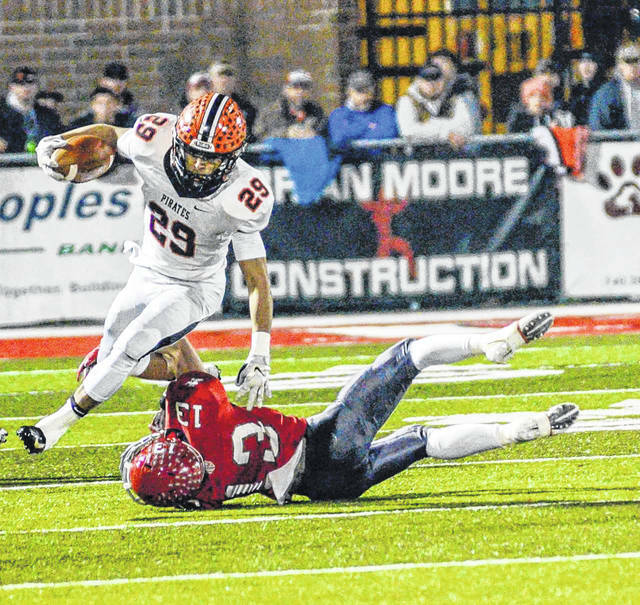 On their first drive, senior quarterback Trent Salyers found the speedy junior Makya Matthews in the flat where Matthews then took the pass all the way to the end zone for a 74 yard touchdown reception to give Wheelersburg the early 7-0 lead with 11:01 left in the first quarter. However, the good moments stopped there for the explosive Pirates offense. Johnstown-Monroe proceeded to control the time of possession for the rest of the game in dominating fashion. Full back Luke Myers’ one yard touchdown rush, Alex Jenney’s 23 yard field goal, and running back Bryce Barasch’s five yard touchdown rush added 16 points to the Johnstown-Monroe total giving them the halftime lead of 16-7. At the break, the Johnnies led the time of possession 18:07 to 5:53 over the Pirates. The third quarter featured much of the same from the Pirates offense, and the exact same time melting drives from the Johnstown-Monroe offense. Second half rushing touchdowns by Barasch and Myers, and another field goal from Jenney made the Johnnies lead 32-7 late in the fourth quarter. Fighting till the last minute, Salyers found senior wide receiver Tanner Holden for a five yard touchdown pass to cut the Pirates deficit to 32-14 in what would ultimately be the final score of Saturday night’s Division V state semifinal contest. As a senior class, this group of Pirates who will graduate in the spring have put together an impressive 52-4 record in 56 career games, with incredible statistical feats to go along with their win/loss percentage. 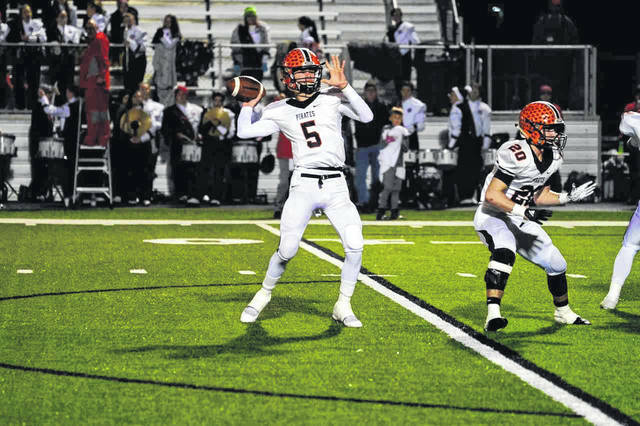 It is, undoubtedly, one of the winningest classes in Southern Ohio football history, and one Wheelersburg fans should be nothing but proud of.